Hello and welcome to another update from Ostersund! We have now completed 11 seasons with the Swedish club and we are consolidating our position as Sweden’s greatest team. 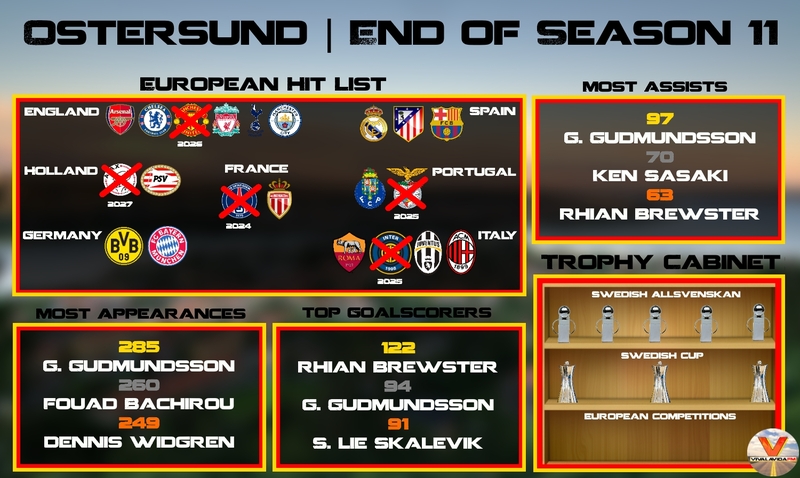 In this post, we review the 2027 season to see if Ostersund can continue their progress in Europe. We made just the three transfers throughout our eleventh season. I’m certainly finding it difficult to continue to improve on the current players in our squad – I think this is to do with the fact Sweden are still rated as the 6th highest league in Europe. We really need to push on in Europe and hope that our fellow Swedish clubs do the same. Nonetheless, the calibre of our three signings is of a high standard. Petkovic comes in as our first-choice right back and already is our most talented RB of the save so far. Centre-back Meckarovski comes in as our first choice centre-back alongside Dmitrovic with Mexican wonderkid Villalva joining the club as a central midfielder. The main outgoing player was Japanese star Tatsuro Tai. You’ll notice that upon joining Bayern Munich his media description has updated to describe him as a world-class player. He left the club for a record £32.5M and I am very happy to see him move on – he was beginning to kick up a fuss after several lower bids were rejected. We were drawn to play holders Manchester City in the last 16 of the Champions League. In the first leg (at home) we battled well and earned a 2-2 draw, but this was never really going to be sufficient as we would have to now go to England and win – a 3-3 draw is nothing to rely on! We lost the second leg 4-1 after pushing for goals late on. Nothing to be ashamed about and City went on to win their second consecutive Champions League title. The quest set out several seasons ago was to become completely dominant in domestic football. This begins with the Swedish Cup which precedes each domestic league season. This year we breezed through the group stages and knockout rounds to reach the final. Here we would play Norrkoping, the club who are definitely our ‘bogey team’ of this save. This easy 2-0 perhaps signalled the arrival of the invincibles of Ostersund. We were completely on top in this game against one of our strongest challengers in Swedish football. A good sign for the upcoming league season. Unbeaten in our first fifteen games further enhances our status as Sweden’s best side. 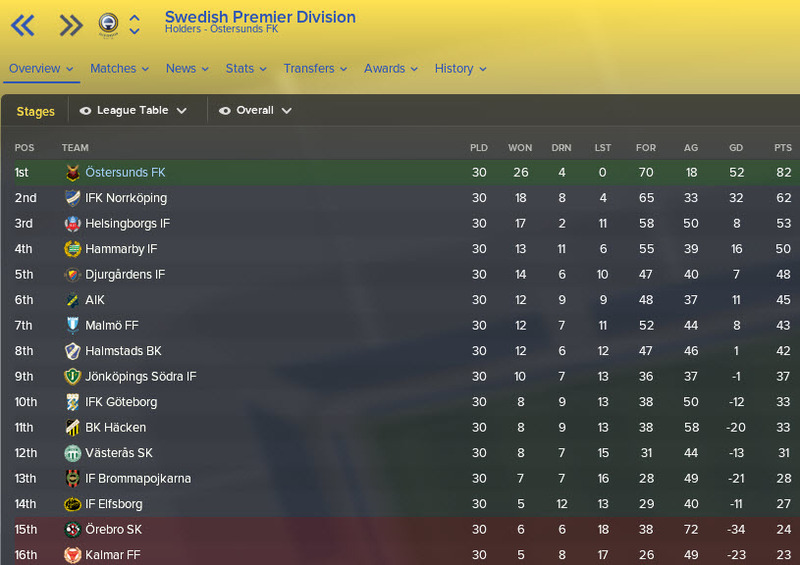 We comfortably led the Allsvenskan at the halfway stage and will be searching for our first unbeaten season eleven seasons in. You would say that this Champions League group stage is perhaps the easiest we have been drawn so far. Previous years have seen us face PSG and Atletico Madrid, Manchester United and Napoli etc. We have beaten Inter Milan before and I feel comfortable facing Lyon and Ajax. Indeed, we secured our progression with one game to go, despite recording our first loss of the group stage vs Ajax. Thanks to our final two matches we actually finished second in the group which does not favour us moving into the knockouts. We really should have pushed on from a great start to secure first place in the group. We have been drawn to play Sevilla in the next round – a somewhat favourable draw considering the potential opponents! Now to find out whether we can record an unbeaten season after two previous years with just one loss. The invincibles! 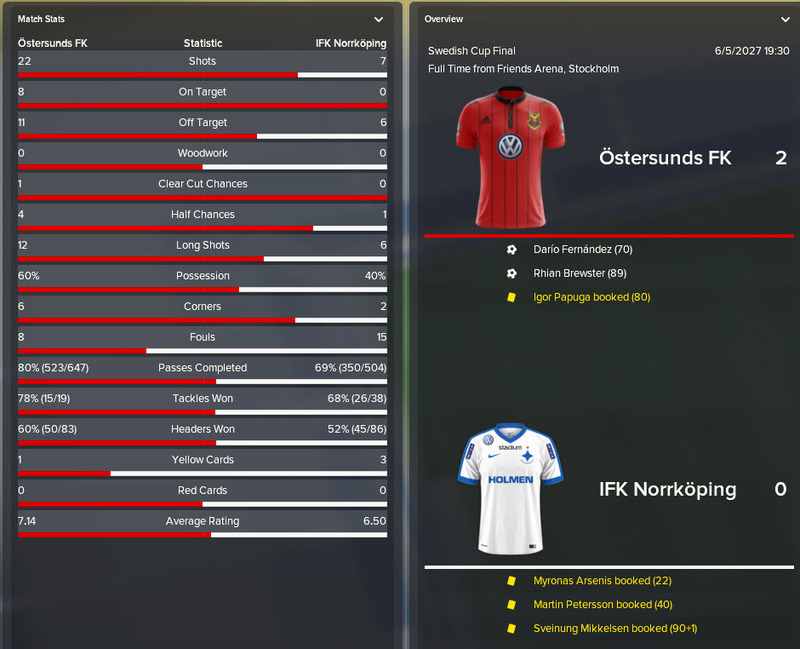 Ostersund have done it, we dropped just two points from our final fifteen games to secure the title (our fourth consecutive) and truly assert our hold over other Swedish clubs. Malmo have had a terrible season, finishing in 7th place, 39 points behind us at the top. Thanks to another impressive season, our managerial statistics are looking rather good. The above graphic is one that I’ll be updating each season. You can see which players are leading the way in terms of appearances, goals and assists. You can also see our growing trophy cabinet. The main thing in the graphic is our European hit list. Shown are a number of clubs across Europe that I am aiming to beat throughout my time with Ostersund. This is a new ‘goal’ for the save as we transition from aiming for domestic to European dominance. So far we have knocked off five clubs and we’ll be looking to add to that number in coming years. Thank you very much for reading another instalment of our Football Manager 2018 story here on VivaLaVidaFM. We are eleven seasons into our adventure in Sweden and it doesn’t look like ending anytime soon. 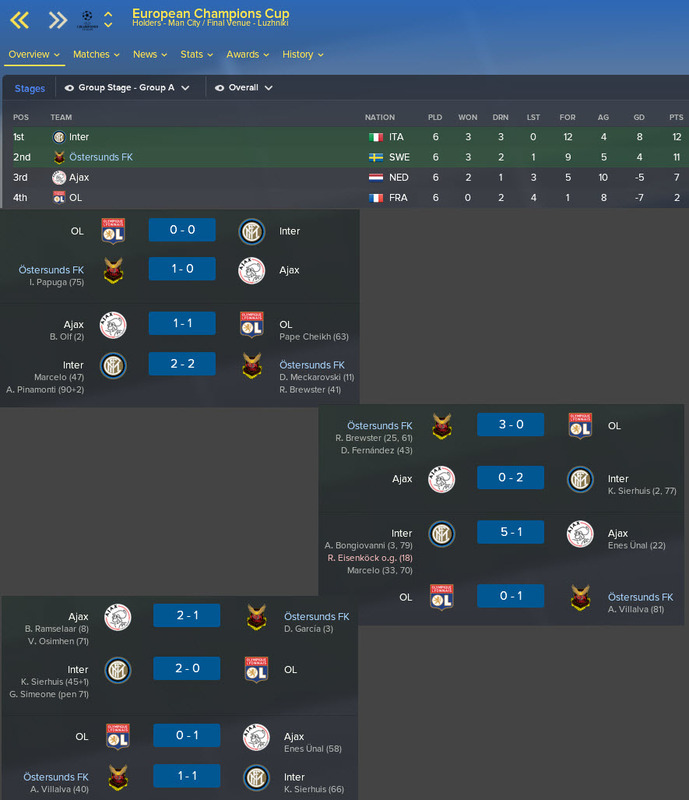 The dream is to win the Champions League! If you enjoyed this post, do leave a like or a comment, let me know what you think of our save so far. Be sure to follow me on Twitter as I will be posting many save updates there! This entry was posted in FM18 Stories, Football Manager 2018, Oscar Friberg, Ostersunds FK | @VivaLaVidaFM and tagged champions league, europe, fm stories, fm18, football manager, Oscar Friberg, ostersund, sweden, swedish allsvenskan, swedish cup. Bookmark the permalink.